As of March 1, 2014, the per book price will go up to $13.25, still a significant $11.70 discount. I have built in additional discounts at quantities of 100 books ($0.75 per book) and 400 books ($1.50 per book). 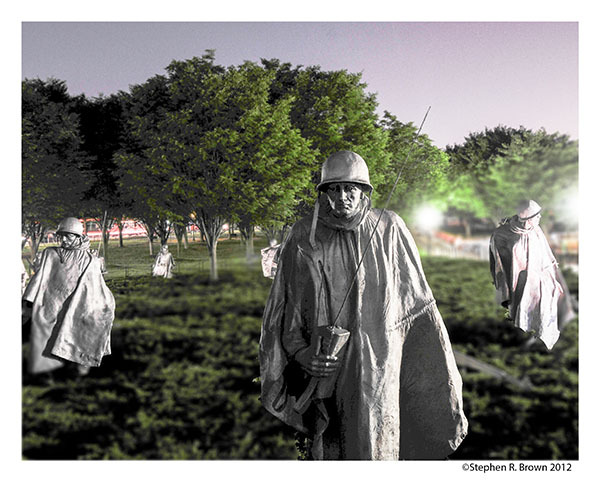 As usual, I will include a separate poster of the Korean War Memorial to those Honor Flights purchasing DC PHOTO BOOK. There are unresolved legal issues surrounding the Korean Memorial which make it difficult to publish photography of the Korean War Memorial so this separate “free” poster seems to be a nice workaround. DOWNLOAD A SAMPLE OF THE EPUBS! They are an innexpensive way to distribute information about the WWII Memorial to libraries and schools. History is expensive to maintain… and more expensive to distribute… and the tablet can significantly reduce the cost. The “fixed-format” ePubs retain the style, design and brilliance of the original paper book. I am working to introduce the book into educational curricula as many school systems across the country are adopting tablets. The luminance of the backlit screen makes the images stand out far better than paper. These E-ditions can be hooked up to a projector and distributed and reproduced in large quantity at relatively no cost. It’s free….and it’s smart and all three books work on both Android and iPhone devices. They can also be used on the buses to aid your passengers in their sometimes confusing trip around Washington, DC. February 10, 2014 | Filed under Blogs, Books, DC Photo Book, Honor Flight, WWII Memorial and tagged with Arlington Cemetery, Art, Chesapeake Bay, DC PHOTO BOOK, Environment, Estuary, Honor Flight, infrared, Iwo Jima, Jewel of the Mall, John Smith Trail, National Park Service, photography, Senator Dole, Washington.